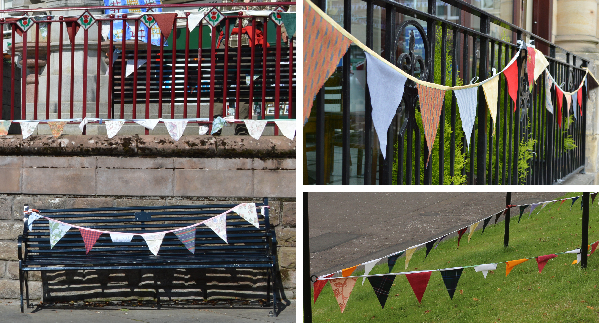 One of Crieff High Street Arts Festival’s great triumphs since it began was the Great Bunting for Crieff project. June McEwan had the idea for the project after the Highland Games in 2013. The volunteers who had bedecked the town in colourful decoration had been unable to continue and the town remained unadorned. A wee chat with Fiona Gilbert of Remake Scotland alerted June to the existence of the Guinness World Record for bunting. The idea was born and June set about galvanising the local community into working together to challenge the record – the task was to create enough bunting to stretch for 3 miles. ​The call went out for volunteers and June was contacted by lots of individuals and groups ready and willing to contribute. However, it wasn’t just a case of willing hands - the venture also depended on donations of thread, pins, needles, bias binding and fabric from generous members of the local community. A wide range of groups took part from Strathearn Arts Society to Wardside House Craft Group. Both of these groups chose to personalise their bunting by including their group name. The Wardside House group thoroughly enjoyed participating in the creation of 30m of bunting and have since been inspired to make more bunting to decorate Wardside House during their social fundraising event – the Marie Curie Bloomin’ Great Tea Party. For individuals, Remake Scotland held Bunting Fridays – free drop-in classes to learn how to make bunting to the exact specifications required by Guinness. At an evening of Bunting and Banter at Strathearn Artspace, keen bunting makers stitched and chatted whilst being entertained with stories and songs from local author Jess Smith and the melodic mandolin of Nigel Gatherer. At the time Jess commented that holding an evening like this in the 100th anniversary year of the First World War was particularly appropriate because during the war, women would gather to sew bunting in anticipation of welcoming their men home. In the end, the Strathearn effort lost out to Cragg Vale, a village in Yorkshire, which made more than 12km of bunting to celebrate the Grand Départ of theTour de France. Nevertheless, the project was a valuable experience for the community and we now have plenty of bunting for regular events, such as the Highland Games, and for special occasions like the exciting visit of the Earl and Countess of Strathearn in 2015.